The UK's favourite white water lily. This White Water Lily pond plant kit makes a fantastic gift idea and contains everything that you need to grow a beautiful floating pond plant to create a stunning display. The quick and easy way to grow and display a beautiful white water lily, this kit has everything you need, including the planting basket. Growing to around 50cm tall x 150cm wide, this fully hardy lily will fill your pond with blooms from June to September. Kit includes a white water lily (Nymphaea albida), planting basket, top quality aquatic soil and decorative gravel. A free-flowering waterlily and one of the most popular, Nymphaea albida produces a profusion of fragrant white flowers with a yellow centre from June to September. 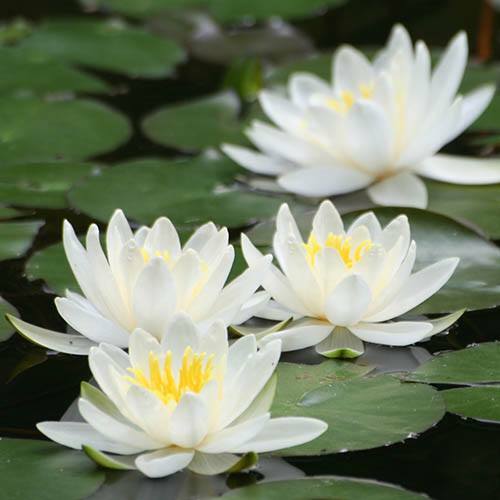 An excellent choice for a wildlife pond, when fully established, this white water lily provides shade and shelter for fish and other aquatic wildlife. Additionally, the plants will help reduce the occurrence of blooms of algae, supressing blanket weed and other pond nasties, while at the same time improving the oxygen content. Kit includes a white water lily (Nymphaea albida), planting basket, top quality aquatic soil and decorative gravel. Growing to around 50cm (above water) tall x 150cm wide, this fully hardy lily will fill your pond with blooms from June to September.